NOTE: This content is old - Published: Friday, Oct 2nd, 2015. An online consultation has been launched on Arts Hub proposals, as Wrexham.com learns the usually public scrutiny by Councillors that could affect the town’s indoor markets will likely be held in secret. Wrexham Councillors will examine a formal report on the business case and associated Arts Hub plans on the 2nd of December, with the planning application for the proposed changes having already been submitted in the previous month of November. Wrexham.com has been told that the report to Councillors at the Scrutiny stage, and likely the Executive Board stage on the 1st February 2016, will be suggested to be held in ‘Part 2’ of the meeting where media and members of the public are removed so it can be discussed in private. We are told ‘both reports will need to be considered to be kept in Part 2’ as they will ‘contain information regarding the future cost of the scheme which at this stage will be commercially sensitive’. The cost of the scheme was recently described as £3m in this industry article citing Featherstone Young ‘winning’ a ‘publicly tendered contract’. What has happened before in similar scenarios is elements of plans are discussed in Part 1, the open to all section of meetings, with discussions involving contracts or the employment of individuals and the like held in Part 2 to maintain privacy and economic advantage. Previously Wrexham’s Council Leader Mark Pritchard has expressed a desire to ensure where possible such reports are split between Part 1 and Part 2 in the interests in transparency. Examples where that has happened include the discussions involving Waterworld and Plas Madoc, where the overall concepts and information were discussed in public but the financial nitty gritty taken into the secret Part 2, a similar method when Council budget cuts are being discussed with the wider plans focusing on finances looked at in public, but staffing and contractual issues kept understandably private. Cllr Pritchard and Part 2 issues surfaced earlier this year with his comments about the Peoples Market ‘not working’ being ushered into Part 2 back in August 2014 in connection with the Arts Hub. One long term member of the local arts community had a strong reaction when we explained the proposed Scrutiny position, saying: “This approach will only lead to further suspicion. There’s space in Wrexham for both a vibrant Arts Hub, and thriving markets. How the council have managed to turn a genuinely positive investment in the arts infrastructure into a PR disaster is beyond comprehension, but reflects the way they’ve behaved with other similar facilities like Plas Madoc and the Vic Studios. “They need to stop acting like property developers, and start listening to and supporting the communities they purport to represent”. A Wrexham.com Freedom of Information request to see a copy of the Quarterbridge Report was refused, despite our request that copyright information be clearly marked (and therefore not for publication) and any information believed to create data protection issues be redacted. Previously we have written on the tight timeframes involved in the Arts Hub development plans, with only around 30-60 days to pull together the full planning application for submission in November. After querying the relatively short nature, we are told it is ‘considered to be achievable’ in the timescale. Further, due to the short time scales we enquired if there had been any planning work undertaken behind the scenes that had not been shown in public. Confirming the ‘from scratch’ nature of the plans, we were told that aside from the previous Ash Sakula sketches that have been published, no other plans have yet been created. 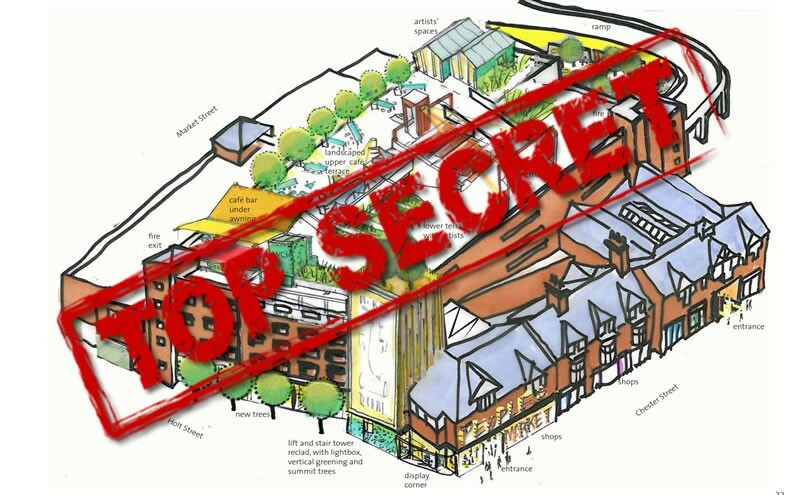 We are told that prior to any planning application being submitted, likely in November, the final plans will be made public for comment – including market traders. Various statutory obligations will need to be fulfilled as well, with the usual notices being placed near the proposed development, and the paid for print adverts in local newspapers being filed. Much discussion has taken place over previous reports on the Arts Hub, with a reoccurring query being voiced on why no ‘yes no’ style question on if the town wants an arts hub has been part of any consultation. Today Wrexham Council pointed out that consultation carried out last year during the Ash Sakula work did ask ‘what benefits would an Arts Hub bring to Wrexham’, with only 6.7% saying no benefit at all with the remainder saying it would contribute to the town’s arts (77%), perception (66%), economy (65%), regeneration (71%) and visitor numbers (67%). To take part in the consultation you can either visit the Peoples Market and find the presentation panels, or with the online consultation now live – you can take part by clicking here!